I am not blessed with the best pair of brows, not because I was last in line when the perfect brow gene was dealt. No, it’s 100% my own fault because I went through a ‘tweezer happy’ phase in my teens and the phase lasted for about 6 years… You can imagine the utter disaster I had to deal with in my twenties. Needless to say, my brows never really grew back and I am stuck, to this day, with sparse and short eyebrows. If I could go back in time, I would stab myself in the eyeball with a tweezer on that very first day I started plucking…that would teach me a lesson! Up to the age of about 25 I never really thought there was anything I could do about my brows. I didn’t fill them in with a pencil or brow powder because I didn’t know how and I felt quite despondent when it came to my brows. Looking back at photos taken of me in my early twenties now, I cringe. I can’t remember which monumental moment sparked the will to start filling in my brows but I think it was after watching Makeup By TiffanyD’s YouTube videos – I have been subscribed to her channel for the last 6 years and haven’t missed a single video! Tiffany has done quite a number of videos and blog posts on how she fills in her brows, and I have learnt a lot from her. She does have perfect brows to start with, so I kind of just had to teach myself what looks best on my face, where my arch should be and what products work best for me. I’m happy to report that I am now a semi-ninja when it comes to my brows, and I can fill them in with my trusty MAC Lingering brow pencil in 2 minutes flat. I receive compliments on my brows quite regularly, even a sweet Woolworths cashier recently said to me: “You and your beautiful brows must have a nice day.” I’m not blowing my own horn at all, but just wanted to let you know that it is possible: You don’t have to have good brows, to have good brows. 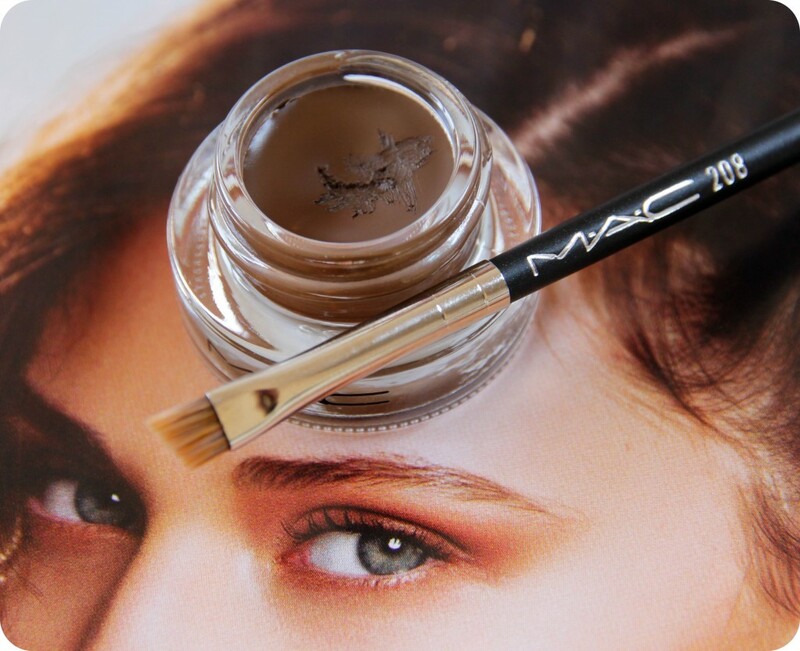 On with the ‘Hot Off The Shelf’ blog post – I mentioned the limited edition MAC brow products in this blog post and also mentioned that I wanted to get my hands on the Fluidline Brow Gelcreme products. I stalked my local MAC counter for quite some time & was very happy when I managed to be at the counter as they were unpacking the stock. 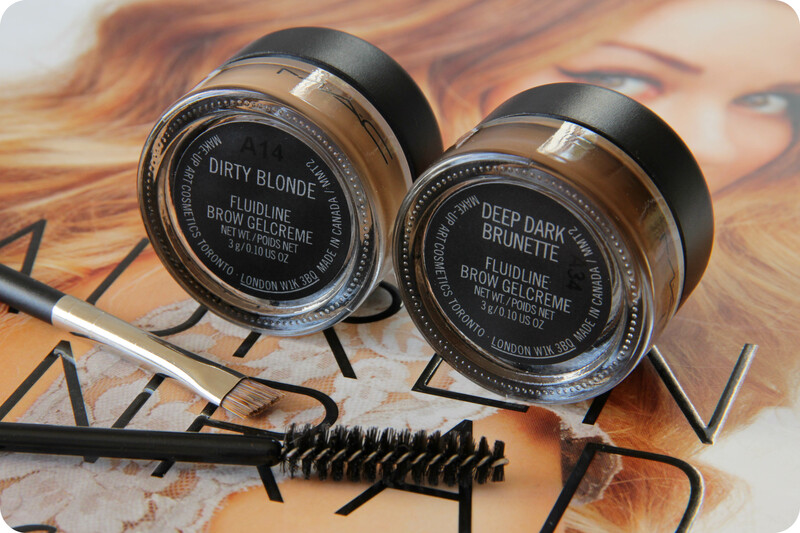 I swatched all 3 Gelcreme products and decided to get ‘Dirty Blonde’ and ‘Deep Dark Brunette’. ‘Auburn’ is a bit too warm-toned for me, but is perfect for redheads and strawberry blondes. I also picked up the limited edition MAC 208 Angled Brow Brush because 1. I don’t own a brow brush; and 2. I really wanted to up my brow game (there’s always room for improvement, girls). I guess one could also use an angled eyeliner brush but I decided to give this brush a go! 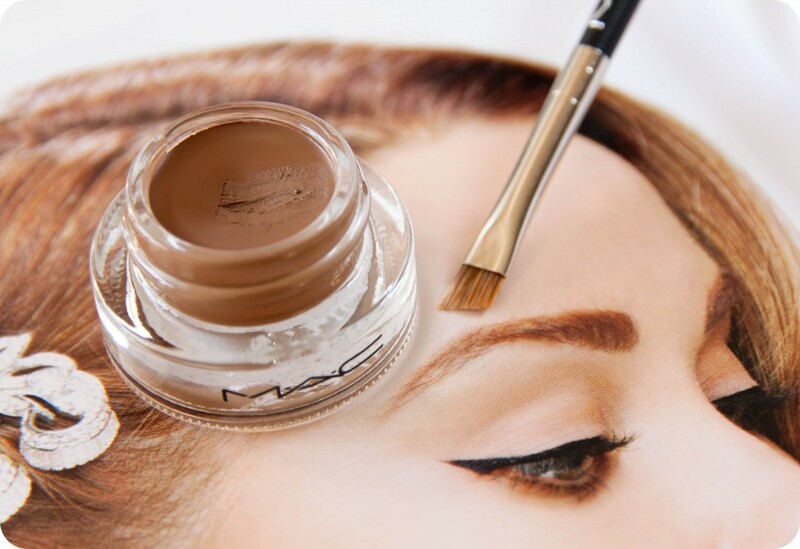 The MAC Fluidline Brow Gelcreme products are said to be long-wearing, waterproof, sweat-proof and smudge-proof, so they are PER-FECT for hot & humid Summer weather here in South Africa. Their consistency is a bit lighter and a bit more fluffier than a gel liner. I can definitely attest to the long-wearing ability of these, the 2 swatches you will see below lasted a full day (12+ hours), through washing my hands with Dettol hand soap a couple of times and rubbing as one does during the day. I usually have to use an oil-based makeup remover before I cleanse my face, to ensure these babies are removed completely. 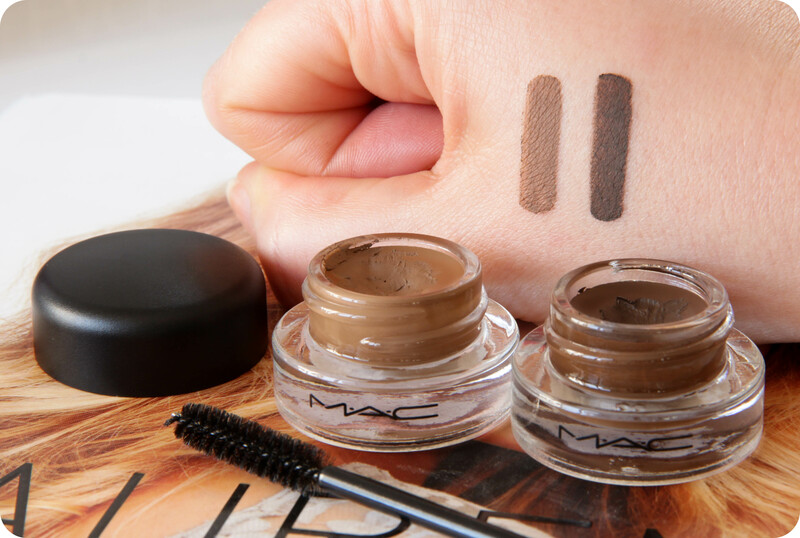 MAC Fluidline Brow Gelcremes fill and set, all in a single product. They are super pigmented, creamy, smooth, and set quickly but not too quick that you don’t time to fix mistakes or blend. MAC Fluidline Brow Gelcreme in Dirty Blonde is a warm taupe-brown shade, it’s not a true taupe shade as it isn’t completely cool-toned. I would describe it as a soft taupe shade with a slight yellow undertone. I’ve never used a cream-pot type of product on my brows before, so using this product has taken some getting used to. The secret to these cream gel brow products is to use very little product and a very light hand when applying them to your brows. MAC Fluidline Brow Gelcreme in Deep Dark Brunette is a rick, dark brunette shade with warm undertones. As it turns out, Deep Dark Brunette is too dark for me, so I will use it as an gel eyeliner (I am hoping it’s suitable for the lash line but only time will tell). I imagine this shade will only work on people with really dark brows to start off with, or someone who has a dark skin tone. The swatches you see below are fully opaque swatches, just to show off the actual tone of the shades. One would NEVER apply these products with the intensity of the swatches, remember – a very light hand will ensure a soft, natural-looking brow. To Apply: I start off by combing through my brows with a spoolie or old (clean) mascara wand. I like to use the MAC 208 to fill, lengthen and shape my brows (I use Dirty Blonde for this as Deep Dark Brunette is too dark), mostly just in the outer tail area to sharpen, define and lengthen at the ends. Then I’ll run the brush lightly along the entire length of the brow for some soft definition. I then go in with my spoolie again to brush through the hairs using an upward motion, this gives the brows a softer look. I’m still getting the hang of using a cream gel product on my brows, some days I find them a bit difficult to work with because it feels like they sometimes create a brow-look at is a bit too painted on for my liking. But it’s all in the application, so I’m not blaming the product for this. These products do take a bit longer to apply, compared to your normal pencil or brow powder, because you have to be precise and at the same time really work the product through the brows. Top Tip: Go easy with these (especially Deep Dark Brunette), as they are pigmented as heck. I suggest lightly tapping the brush on the surface of the product, and then dab on the back of your hand (or in the lid) before applying on the brows. Also, when choosing your brow shade, look for a shade lighter than your hair colour. I’ve found that brow products that are more than one shade darker than my hair, makes my brows look stark and harsh. The MAC Fluidline Brow Gelcreme products retail for R 200,00 each & the MAC 208 Angled Brow Brush retails for R 245,00. They should still be available at your local MAC counter, otherwise the MAC South Africa online store still has most of the ‘Waterproof Brow’ collection in stock. Do I recommend them? Whether these will be worth it for you, will depend on whether you can find a shade (1 of the 3) that suits your brow colour. If you are a total newbie when it comes to filling in your brows, then I think these might put you off because it is very easy to overdo your brows when using the Fluidline Brow Gelcremes. If you are someone that doesn’t really need to create a whole new shape to your brows, someone that just wants to fill in a couple of sparse areas and set the brows for a long lasting effect, then these are definitely for you. I think that once you get used to the intensity and texture of these products, you will love them for your brows (I’m still getting used to mine). I wish this brow collection was permanent, especially since South African beauties don’t have access to Anastasia Beverly Hills brow products. And I also think expanding the colour range of the Fluidline Brow Gelcremes would be a good idea, especially adding shades that have neutral or cool undertones. Happy Thursday, everyone! Better days are coming – they are called Friday, Saturday and Sunday! Next Post YouTube Video – Empties #1 | MAC, L’Oréal, Sorbet, Moroccanoil & More! Ah so jelly that looks amazing!! Bought Dirty Blonde when it was released here in Oz and even though I have brunette hair, it works perfectly for me. Ooooh, I’ll be stopping by my MAC counter after work… Thanks for the review. These sound great, deep dark brunette would probably work for me! Will definitely go and check it out! Thanks for the great review! Thank you for the informative post, Luzanne. I definitely want to still try get my hands on an Anastasia Beverly Hills Dipbrow Pomade, even if just to compare it to my MAC one. Love how neat your swatches are, if I were a blogger mine would look like a hot mess!!! I’ve seen a few YouTubers using these, but I haven’t seen or read many reviews on them. I wonder how they compare to the DipBrow from ABH…which by the way, I’m SO sorry you guys don’t have access to ABH, total bummer!!! I don’t use the DipBrow, but I’ve been thinking of purchasing one and giving it a try…who knows, I’m pretty happy with my current brow routine. By the way, you do have great brows!! Great informative post as always! Have you tried the Smashbox Brow Tech To Go?